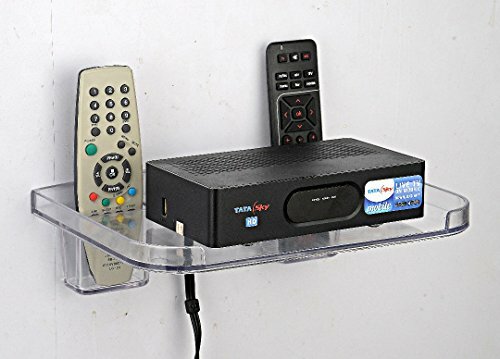 SET TOP BOX HOLDER SHELF TRAY MADE OF HIGH QUALITY PLASTIC. IT HAS TWO SLOTS FOR HOLDING REMOTES OF TV AND SET TOP BOX.THE UNIT IS SUITABLE FOR HOLDING ALL TYPES OF SET TOP BOXES. We all know that there is small gap between cabinet and refrigerator, between washing machine and wash basin, or other places. Now, we recommend you a novelty multi-purpose crevice gap storage rack shelf with the width of only 13cm, which can not only make full use of those gaps to save space, but also conveniently organize and store small items for easy to find. 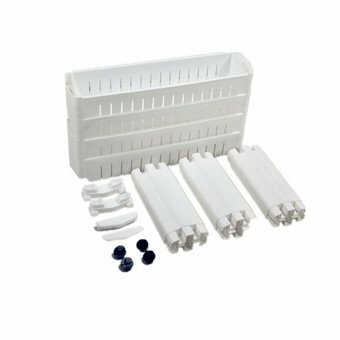 The 3-layer storage rack is made of high-quality hard plastic for safe and durable to use, and features built-in removable wheels design for convenient to use. With detachable design and easy to clean, it is really a wonderful household commodity shelf perfect for washing room, kitchen, drawing room, bathroom, bedroom, etc. Features - Color: white.- Material: durable hard plastic.- Size (L*W*H): 54cm x 13cm x 103cm- 100% brand new and high quality Multi-purpose Movable 3-layer Plastic Storage Rack Crevice Gap Commodity Shelf.- Can make full use of the gap between cabinet and refrigerator, between washing machine and wash basin, between sofa and wall, between bed and bedside table, and other available gaps you could think of at home or in office.- Crevice gap storage rack, easy to store in any crevice or gap, to save the space.- With hollow-out 3-layers design, the storage rack can be used to organize and store all kinds of small items, such as bottles, jars, seasoning pots, cosmetics, snacks, etc.- Built-in removable wheels design for convenient you to get the items you want.- Detachable rack design, for easy to clean.- A wonderful storage rack suitable for kitchen, washing room, drawing room, bedroom, office, etc.